Product prices and availability are accurate as of 2019-04-14 19:17:39 UTC and are subject to change. Any price and availability information displayed on http://www.amazon.com/ at the time of purchase will apply to the purchase of this product. 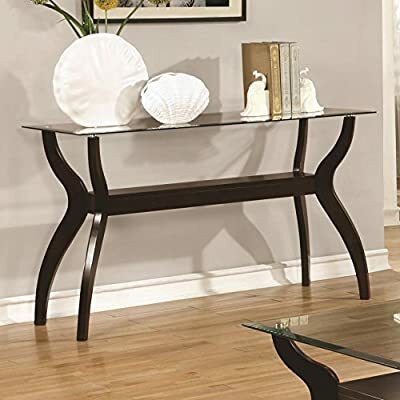 This coaster casual Cappuccino sofa table with glass top measures 19" length x 48" Width x 30" Height. With an updated mid-century modern style, this sofa table features easy-to-clean glass, sleek legs, and storage shelves underneath. Finished in a deep Cappuccino, this elegant piece of furniture can bring together any room that is in need of an upgrade. Place plants, books, or art on top of the glass surface to complete the look.